Need more information about booking Home 354574 ? Apartments Kestenovi dvori are private accommodation with modern and full equipped apartments which are provided by free Wi-Fi and parking spaces. 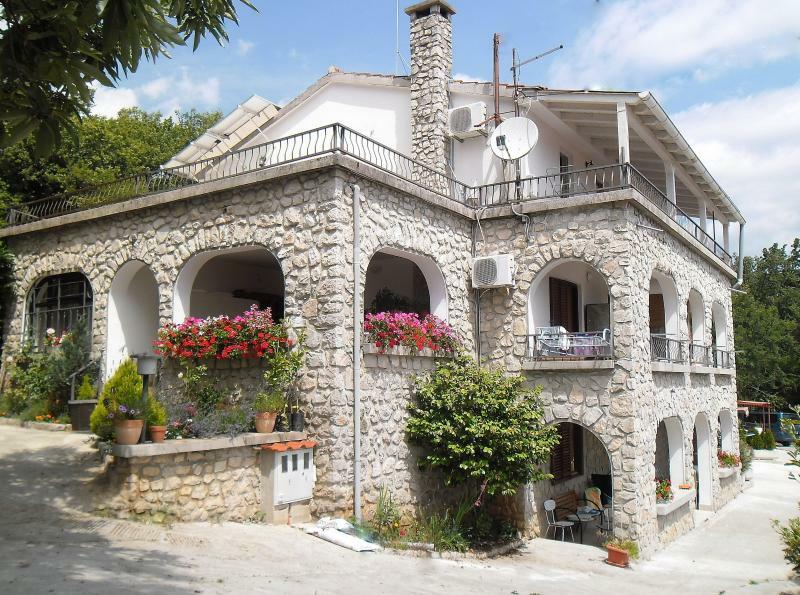 This holiday house with a magnificent overlook at the sea, is located in a very calm part of Lovran to 2 km from the coastline and 6km to Opatija. Surrounded by plenty of greenery and located on a dead-end street away from the noise this vacation home will ensure you complete rest and relaxation. Apartments are size of 40m2, suitable for 2-5 persons and each apartment has its own separate entrance,terrace ,bedroom,private bathroom with bathtub or shower and an equipped kitchenette with fridge,stove, microwave, coffee-machine and all the necessary utensils. The bedroom is with one queen size bed and plus one additional bed, while living room is with sofa suitable for 2 sleepers.Satellite TV, air-condition,free Wi-Fi internet are available in each holiday apartment.Bed lines,blankets and towels are provided in the apartment. For full enjoyment of the holiday and friendly atmosphere, there is also a spacious common garden and BBQ grill terrace with magnificent overlook of all Kvarner bay. If you like greenery,freshness,peace and waking up with the birds chirping then this house in Opric is right place for you! Thank you and we are looking forward to welcome you here!